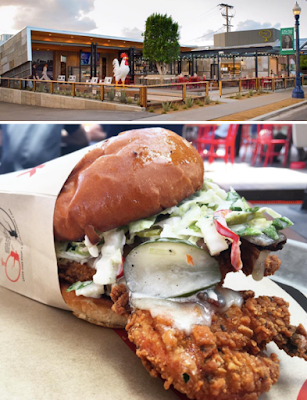 Celebrity Chef Richard Blais and his partner-in-eats Michael Rosen are packing the house daily at their casual, outdoor Little Italy eatery The Crack Shack, so it is no wonder that the dynamic duo are planning to expand to two new locations in San Diego's North County. Set to open at 407 Encinitas Boulevard at the space formerly occupied by Coco's, the gigantic space will get a total remodel and The Crack Shack Encinitas could open by December 2016 with a Costa Mesa location planned to debut as early as March 2017. The Encinitas based The Crack Shack will be renovated to have an al-fresco feel like the Little Italy location. Within the 150-seat eatery, there will also be an outdoor patio, a bocce ball court, a walk up counter, a full bar, a giant chicken, and a similar menu with additional items unique to the North County location, including healthier, rotisserie chicken options. The Costa Mesa branch has already been leased at an unknown location and is slated for a March 2017 opening. Rosen & Blais intend to continue expanding The Crack Shack concept throughout Southern California if their success continues. Is another Juniper + Ivy in the works too? There's no word yet whether Blais and Rosen plan a second location of their upscale, critically acclaimed restaurant, but with the expansion of The Crack Shack, this is definitely a possibility. We will let you know when we learn more! For more information on The Crack Shack, visit crack-shack.com.